Texas Hill Country is perhaps the most scenic region of the Lone Star State. Texas spills over with spectacular retirement destinations, from the glittering big cities like Houston and Dallas to history-rich San Antonio and palm-tree-dotted towns in Coastal Texas. However, there’s no place in Texas quite like the Texas Hill Country. This famed region in Central Texas simply stands apart, beautifully combining urban and rural living with plenty of down-home Texas charm. Living in the Texas Hill Country gives residents many reasons to pause and appreciate all the area offers. The Texas Hill Country encompasses a sizeable swath of the Lone Star State, including San Antonio and the state capital, Austin. Dozens of large cities and small towns make up the Hill Country, from scenic San Marcos and exciting New Braunfels to historic Llano and the bluebonnet-lined streets of Willow City. Active adults can discover many desirable retirement destinations in Texas, but the Texas Hill Country maintains its own special allure. Here are a few reasons why retirees are turning to the Texas Hill Country to hang their hats. Bluebonnets are a great sight come Springtime. With a vast array of regions boasting everything from desert landscapes to gulf sunsets, there’s no denying Texas is a beautiful state. Natural splendor abounds, from bluebonnet trails to grazing cattle in rolling fields. 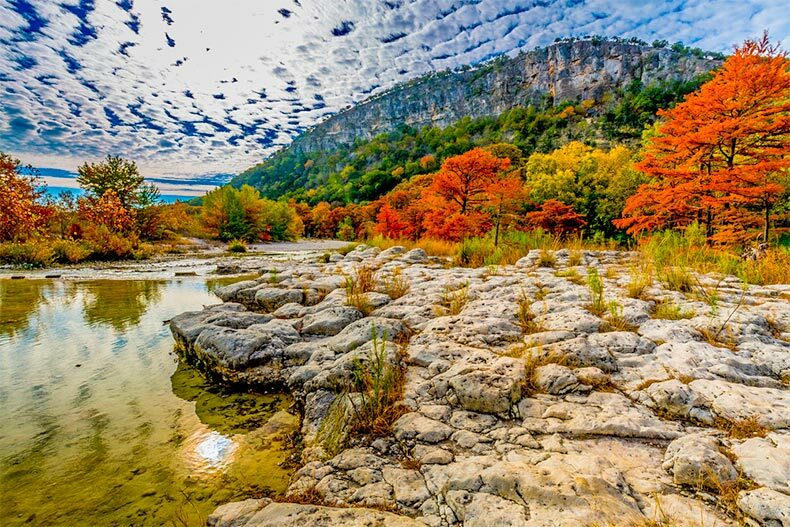 The Texas Hill Country contains some of the country’s most beautiful destinations, from the majestic oasis of Hamilton Pool to the pink granite dome of Enchanted Rock. There’s a good reason this region is named the Hill Country. While much of Texas remains flat and wide open, the Texas Hill Country features serene hills along with plenty of spring-fed rivers and cultivated vineyards. In the spring, Texans can soak in the beauty of their beloved state flower, the bluebonnet. Few places in Texas put on a prettier show of bluebonnets than the Texas Hill Country, where bluebonnets bloom for about six weeks from March to mid-April. 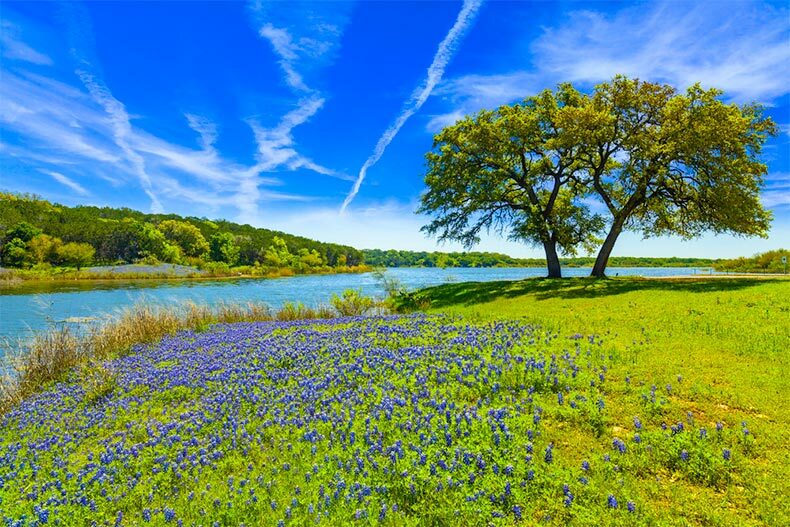 Active adults can take a scenic drive through the Hill Country to experience breathtaking displays of bluebonnets that can't be found in such vibrancy anywhere else. Whether active adults want to relax or play, they can do it all in the Texas Hill Country. There’s an easygoing nature in the Hill Country that makes it appealing. Locals and tourists know they are free to experience and explore at their own pace. Retirees can get a taste of Texas in quirky towns or enjoy some live music in Austin, the live music capital of the world. They can two-step at legendary Gruene Hall, Texas’ oldest dance hall, or kick back on an inner tube and float the lazily winding waters of the Comal River. The region also abounds with a mix of varying destinations, from charismatic small towns to sophisticated cities brimming with world-class dining and entertainment. Active adults who like a little variety will appreciate the diversity of the Texas Hill Country. Texas is home to incredible Tex-Mex and barbecue, which active adults can certainly feast upon in the Texas Hill Country, but the region also boasts many different flavors. In Fredericksburg, which was founded in 1846 by German immigrants, retirees can get a taste of traditional German fare such as bratwurst and sauerkraut with mustard. Retirees with a hankering for sweets can sink their teeth into a scratch-made apple strudel at Naegelin’s Bakery, the oldest bakery in Texas. Founded in 1868, this local favorite bakes up a mouthwatering assortment of cookies, pies, and pastries, but the strudel remains the star offering. The Hill Country is full of wineries, big and small. Active adults who appreciate a fine glass of wine will feel right at home in the Texas Hill Country, which is one of the country’s largest wine destinations and has been ranked by Wine Enthusiast as one of the nation’s top 10 wine destinations. Active adults can take a leisurely tour of Hill Country wineries along the picturesque Wine Road 290, which features 15 award-winning wineries. Wine aficionados never miss a visit to Duchman Family Winery, which uses 100-percent Texas grapes in its wine. 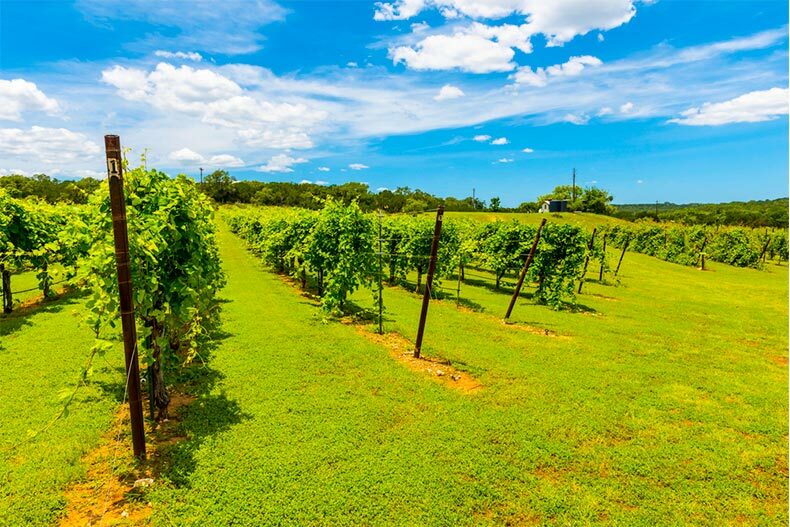 This winery is the perfect place to pack a picnic, sample some wines, and savor the stunning Texas Hill Country views. HGTV ranked Duchman Family Winery as one of the 20 most picturesque wineries in the country. Deep in the heart of Texas, retirees can experience a vibrant, fun-packed way of life. The Texas Hill Country is full of rich culture, natural beauty, and an abundance of 55+ communities that put retirees in the middle of it all.